Above: Bite Me Bakery's Chai Latte cupcake. Photos by Rebecca Andre. 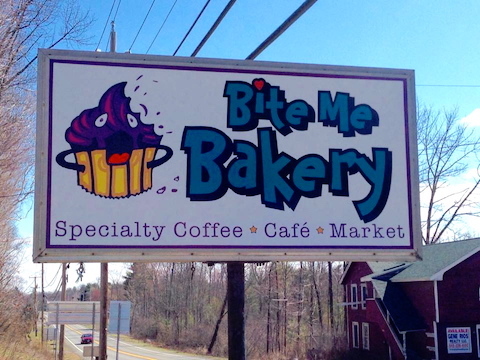 Although Bite Me Bakery opened for business on April Fool’s Day, for the faithful customers and employees of the recently shut down Mama's Boy Market in Phoenicia, this was no joke. They are serious about helping Bite Me Bakery, located on Route 28 in the Ulster County hamlet of Shokan, thrive. "We are like family," said Bite Me Bakery’s owner, Gillian Johnson, who managed Mama's Boy Market until it closed last November. A mother and cupcake connoisseur who has been in the restaurant business for 18 years, Johnson suddenly found herself jobless when Mama's Boy Market abruptly closed. She had quietly built up a loyal following for her cupcakes, which she baked on the side while managing Mama’s Boy, and had thought of opening up her own restaurant in the past. 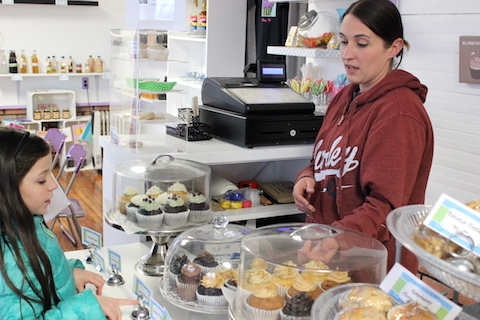 Above: Bite Me Bakery owner Gillian Johnson talking cupcakes with a young customer. So the newly-unemployed Johnson decided to open her own shop. She used her personal savings, some small-scale fundraising and maxed out 27—yes, 27—credit cards to fund her dream. With the help of a volunteer crew of part-time employees who are working without wages while the bakery gets on its feet, Bite Me Bakery was born. 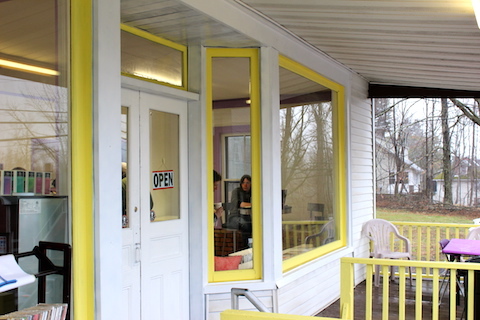 The Bite Me Bakery storefront, a building at the crossroads of Route 28 and Reservoir Road, had sat empty for years after once housing a pet grooming business. Hard labor was needed to transform the space into a restaurant, she said. Johnson recruited friend and Mama's Boy co-worker Laura Dywer, and the two worked painted, cleaned and stripped the floors, some of which were covered in seven or eight layers of old paint. Dwyer is now the bakery's manager. "There were nights my hands went numb," said Johnson. When a friend loaned them a sander, the women were able to restore the pine flooring to an almost original luster. Above: Bite Me Bakery's front porch. Neither of them was paid for their work, and the volunteering hasn't ended with hard labor. All Johnson’s current part-time employees, including Pete Quick, the assistant manager, and Johny Dwyer, who designed the bakery's logo, are working temporarily on a volunteer basis. According to Johnson, there is a waiting list of folks lining up for summer jobs. "Nobody wants to work with anyone else," she said. Bite Me Bakery serves $2 cups of super-strong Death Wish Coffee and $3 small batch cupcakes baked by Johnson every day. The menu also boasts an assortment of sandwiches made with Boar's Head cold cuts, breakfast platters, miniature pies, cookies by Mountain Baby Bakery, muffins and soups. Some are gluten-free, vegetarian and vegan, and a line of sugar-free cupcakes made with plant-based sweeteners is in the works. Bite Me’s offerings are not only culinary. One side of the café hosts a small market of local goods, gift wrap, cards for all occasions, candy, soaps and organic body scrubs. Johnson contributes a line of her own hand crafted gifts: homemade coffee syrups, sauces (caramel and chocolate) and her Bite Me Granola, a best-seller. 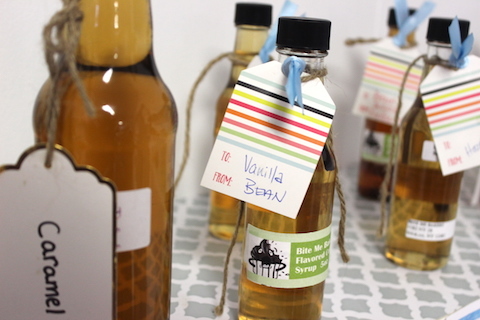 Above: Handmade flavored syrups in Bite Me Bakery's shop. Also displayed is a collection of vintage glassware and dishes. Proceeds from the sale of the vintage dishwear are earmarked to fund an espresso machine and beverage cooler for the café. "Keep the locals happier than anyone"
Pleasing local customers with long hours and low prices is one of Johnson's main goals with her new business. The bakery is open from 6:30 a.m. to 6:30 p.m. seven days a week. Johnson is aiming to serve schoolteachers heading to work at 7 a.m. and the construction workers who stop in for a breakfast sandwich before their workday starts. Hours will be expanding even further in the summer, to accommodate tourists entering or leaving the Catskills via Route 28, she said. 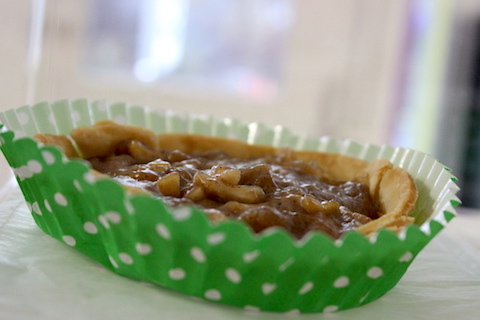 Above: A miniature apple pie. Johnson also hopes that Bite Me Bakery will become a favorite spot for the children in the community. The café’s cheerful colors and eye-level cupcake display is a lure for any kid, as are the cupcakes with names like "S'mores," "Banana & Vanilla Swirl," "Salted Carmel," "Chai Latte" and "Banana Bean." Johnson once hated baking. She preferred cooking dishes for dinner parties of 20 or more of her friends and family in New Jersey, where she lived before relocating to the Catskills five years ago. "I don't like rules. I don't like recipes. I still don't follow them," she said. Above: Bite Me Bakery's sign. But one day, Johnson found herself in need of a last-minute baked treat for her daughter's classroom. At the time, she was broke. So she baked “Monster Eyeball Cupcakes” from scratch, substituting ingredients for the ones she didn’t have on hand. The result was a hit the next day in school. Johnson also found herself carrying on her friends' holiday tradition of baking Italian Christmas cookies, which she is now famous for. "So I am an accidental baker," said Johnson. Along with a passion for baking, Johnson has discovered a passion for people, particularly her coworkers and her ever-faithful customers, who are already following her to Bite Me Bakery from Mama's Boy Market. Some come by three times a day, she said. "I love watching people eat my cupcakes," said Johnson. Above: The "Pay It Forward" board. In an homage to her former place of employment, Johnson has re-introduced the “Pay It Forward” board. Customers can buy an extra cup of coffee or a cupcake, and Johnson will keep a tally on a chalkboard. The next customer that comes by can have a cup of coffee or a cupcake on the house. "I'm determined to make everyone in the world nicer to each other,” Johnson said. Bite Me Bakery. 3182 Route 28, Olive. Below: More cupcakes at Bite Me Bakery.